AMD is a common eye condition and a leading cause of vision loss among people age 50 and older. It causes damage to the macula, a small spot near the centre of the retina and the part of the eye needed for sharp, central vision, which lets us see objects that are straight ahead. AMD advances so slowly in some people, that vision loss does not occur for a long time. In others, the disease progresses faster and may lead to a loss of vision in one or both eyes. As AMD progresses, a blurred area near the centre of vision is a common symptom. Over time, the blurred area may grow larger or you may develop blank spots in your central vision. Objects also may not appear to be as bright as they used to be.AMD by itself does not lead to complete blindness, with no ability to see. However, the loss of central vision in AMD can interfere with simple everyday activities, such as the ability to see faces, drive, read, write, or do close work, such as cooking or fixing things around the house. The macula is made up of millions of light-sensing cells that provide sharp, central vision. 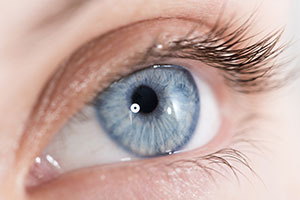 It is the most sensitive part of the retina, which is located at the back of the eye. The retina turns light into electrical signals and then sends these electrical signals through the optic nerve to the brain, where they are translated into the images we see. When the macula is damaged, the centre of your field of view may appear blurry, distorted, or dark. The disease is most likely to occur after the age 60 but can occur earlier with smoking. Research shows that smoking doubles the risk of AMD. AMD is more common among Caucasians than Africans. Family history and Genetics. People with a family history of AMD are at higher risk. At last count, researchers had identified nearly 20 genes that can affect the risk of developing AMD. Many more genetic risk factors are suspected. You may see offers for genetic testing for AMD. That is because AMD is influenced by so many genes plus environmental factors such as smoking and nutrition, there are currently no genetic tests that can diagnose AMD, or predict with certainty who will develop it. 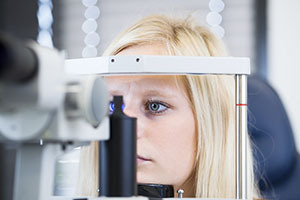 The American Academy of Ophthalmology currently recommends against routine genetic testing for AMD and medical aids generally do not cover such testing. The early and intermediate stages of AMD usually start without symptoms. 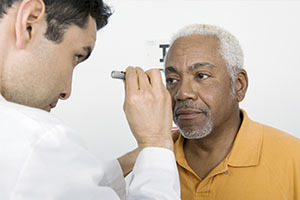 Only a comprehensive dilated eye exam can detect AMD. This eye chart measures how well you see at distances. Your eye-care professional places eye-drops in your eyes to widen or dilate the pupils. This provides a better view of the back of your eye. 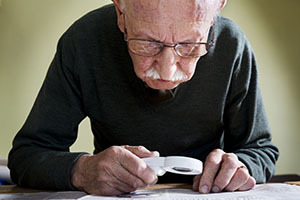 Using a special magnifying lens, they then look at your retina and optic nerve for signs of AMD and other eye problems. 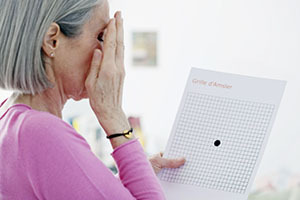 Your eye care professional also may ask you to look at an Amsler grid. Changes in your central vision may cause the lines in the grid to disappear or appear wavy, a sign of AMD. In this test, which is performed by an ophthalmologist, a fluorescent dye is injected into your arm. Pictures are taken as the dye passes through the blood vessels in your eye. This makes it possible to see leaking blood vessels, which occur in a severe, rapidly progressive type of AMD (see below). In rare cases, complications to the injection can arise, from nausea to more severe allergic reactions. You have probably heard of ultrasound, which uses sound waves to capture images of living tissues. OCT is similar except that it uses light waves, and can achieve very high-resolution images of any tissues that can be penetrated by light such as the eyes. After your eyes are dilated, you’ll be asked to place your head on a chin rest and hold still for several seconds while the images are obtained. The light beam is painless. During the exam, your eye care professional will look for drusen, which are yellow deposits beneath the retina. Most people develop some very small drusen as a normal part of ageing. The presence of medium-to-large drusen may indicate that you have AMD. Another sign of AMD is the appearance of pigmentary changes under the retina. In addition to the pigmented cells in the iris (the coloured part of the eye), there are pigmented cells beneath the retina. As these cells break down and release their pigment, your eye care professional may see dark clumps of released pigment and later, areas that are less pigmented. These changes will not affect your eye colour. What are the stages of ARMD? There are 3 stages of AMD defined in part by the size and number of drusen under the retina. It is possible to have AMD in one eye only or to have one eye with a later stage of AMD than the other. Early AMD. Early AMD is diagnosed by the presence of medium-sized drusen, which are about the width of an average human hair. 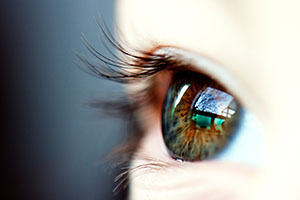 People with early AMD typically do not have vision loss. Intermediate AMD. Intermediate AMD typically has large drusen, pigment changes in the retina, or both. Again, these changes can only be detected during an eye exam. Intermediate AMD may cause some vision loss, but most people will not experience any symptoms. In addition to drusen, people with late AMD have vision loss from damage to the macula. There is a gradual breakdown of the light-sensitive cells in the macula that convey visual information to the brain, and of the supporting tissue beneath the macula. These changes cause vision loss. Abnormal blood vessels grow underneath the retina. These vessels can leak fluid and blood, which may lead to swelling and damage of the macula. The damage may be rapid and severe, unlike the more gradual course of geographic atrophy. It is possible to have both dry and wet AMD in the same eye, and either condition can appear first. AMD has few symptoms in the early stages, so it is important to have your eyes examined regularly. If you are at risk for AMD because of age, family history, lifestyle, or some combination of these factors, you should not wait to experience changes in your vision before getting checked for AMD. Not everyone with early AMD will develop late AMD. For people who have early AMD in one eye and no signs of AMD in the other eye, about 5% will develop advanced AMD after 10 years. For people who have early AMD in both eyes, about 14% will develop late AMD in at least one eye after 10 years. With prompt detection of AMD, there are steps you can take to further reduce your risk of vision loss from late AMD. If you have late AMD in one eye only, you may not notice any changes in your overall vision. With the other eye seeing clearly, you may still be able to drive, read, and see fine details. However, having late AMD in one eye means you are at increased risk for late AMD in your other eye. If you notice distortion or blurred vision, even if it doesn’t have much effect on your daily life, consult an eye care professional. Currently, no treatment exists for early AMD, which in many people shows no symptoms or loss of vision. The doctor may recommend that you get a comprehensive dilated eye exam at least once a year. This essential exam will help determine if your condition is advancing. As for prevention, AMD occurs less often in people who exercise, avoid smoking and eat nutritious foods (mostly green leafy vegetables and fish). If you already have AMD, adopting some of these habits may help you keep your vision longer. Researchers at the National Eye Institute tested whether taking nutritional supplements could protect against AMD in the age-related. Eye Disease Studies (AREDS and AREDS2). They found that daily intake of certain high-dose vitamins and minerals can slow progression of the disease in people who have intermediate AMD, and those who have late AMD in one eye. The first AREDS trial showed that a combination of vitamin C, vitamin E, beta-carotene, zinc, and copper can reduce the risk of late AMD by 25%. The AREDS2 trial tested whether this formulation could be improved by adding lutein, zeaxanthin or omega-3 fatty acids. Omega-3 fatty acids are nutrients enriched in fish oils. Lutein, zeaxanthin and beta-carotene all belong to the same family of vitamins and are abundant in green leafy vegetables. The AREDS2 trial found that adding lutein and zeaxanthin or omega-three fatty acids to the original AREDS formulation (with beta-carotene) had no overall effect on the risk of late AMD. However, the trial also found that replacing beta-carotene with a 5-to-1 mixture of lutein and zeaxanthin may help further reduce the risk of late AMD. Moreover, while beta-carotene has been linked to an increased risk of lung cancer in current and former smokers, lutein and zeaxanthin appear to be safe regardless of smoking status. 400 international units of vitamin E.
80 mg zinc as zinc oxide (25 mg in AREDS2). 2 mg copper as cupric oxide. 15 mg beta-carotene, OR 10 mg lutein and 2 mg zeaxanthin. A number of manufacturers offer nutritional supplements that were formulated based on these studies. The label may refer to “AREDS” or “AREDS2.” If you have intermediate or late AMD, you might benefit from taking such supplements. Be sure to firstly review and compare the labels. Many of the supplements have different ingredients, or different doses, from those tested in the AREDS trials. Also, consult your eye care professional about which supplement, if any, is right for you. For example, if you smoke regularly, or used to, the doctor may recommend that you avoid supplements containing beta-carotene. Even if you take a daily multivitamin, you should consider taking an AREDS supplement if you are at risk for late AMD. The formulations tested in the AREDS trials contain much higher doses of vitamins and minerals than what is found in multivitamins. Tell your doctor or eye care professional about any multivitamins you are taking when you are discussing possible AREDS formulations. You may see claims that your specific genetic makeup (genotype) can influence how you will respond to AREDS supplements. Some recent studies have claimed that, depending on genotype, some patients will benefit from AREDS supplements and others could be harmed. These claims are based on a portion of data from the AREDS research. Finally, remember that the AREDS formulation is not a cure. It does not help people with early AMD, and will not restore vision already lost from AMD, but it may delay the onset of late AMD. It also may help slow vision loss in people who already have late AMD. One option to slow the progression of neovascular AMD is to inject drugs into the eye. With neovascular AMD, abnormally high levels of vascular endothelial growth factor (VEGF) are secreted in your eyes. VEGF is a protein that promotes the growth of new abnormal blood vessels. Anti-VEGF injection therapy blocks this growth. If you get this treatment, you may need multiple monthly injections. 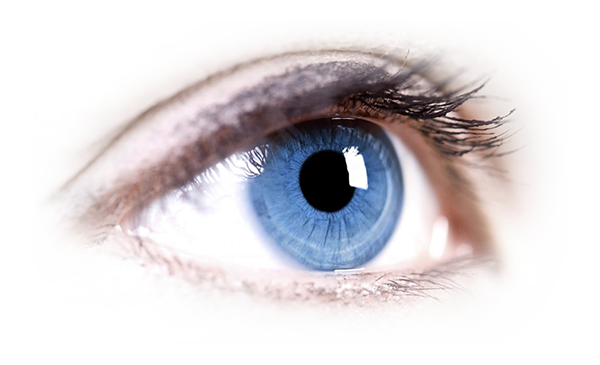 Before each injection, your eye will be numbed and cleaned with antiseptics. To further reduce the risk of infection, you may be prescribed antibiotic drops. A few different anti-VEGF drugs are available. They vary in cost and in how often they need to be injected, so you may wish to discuss these issues with your eye care professional. This technique involves laser treatment of select areas of the retina. A drug called verteporfin will be injected into a vein in your arm. The drug travels through the blood vessels in your body and is absorbed by new, growing blood vessels. Your eye care professional then shines a laser beam into your eye to activate the drug in the new abnormal blood vessels, while sparing normal ones. Once activated, the drug closes off the new blood vessels, slows their growth, and slows the rate of vision loss. This procedure is less common than anti-VEGF injections and is often used in combination with them for specific types of neovascular AMD. Eye care professionals treat certain cases of neovascular AMD with laser surgery, though this is less common than other treatments. It involves aiming an intense “hot” laser at the abnormal blood vessels in your eyes to destroy them. This laser is not the same one used in photodynamic therapy which may be referred to as a “cold” laser. This treatment is more likely to be used when blood vessel growth is limited to a compact area in your eye, away from the centre of the macula, that can be easily targeted with the laser. Even so, laser treatment may also destroy some surrounding healthy tissue. This often results in a small blind spot where the laser has scarred the retina. In some cases, vision immediately after the surgery may be worse than it was before, but the surgery may also help prevent more severe vision loss from occurring years later.